Find what you're looking for in our Helmets section! Our Helmet Cameras section has a wide selection to suit your needs. Our Helmet Bags section has a wide selection to suit your needs. MotoSport has what you're looking for in our Communication section! The dirt bike helmet represents the most customized accessory on the track or trail. It's quite often distinctive, almost always personalized, and the most important piece of riding gear available. Helmets save riders from significant injury and even death. No responsible rider ever heads out for a rip without wearing a helmet. Modern motorcycle helmets boast the latest in technology and research offering comfort, style and the utmost in protection. 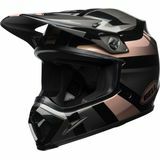 Every Motocross helmet you find on MotoSport.com comes with Department of Transportation (DOT) approval which must pass a government-accepted standard test for helmet safety. Additionally, many helmet manufacturers go a step further and qualify for Snell rating, an independent non-profit organization with a rigorous approval system. Helmets feature a variety of characteristics which range from the number of ventilation ports to the construction material that help make a long day at the track or on the trail safer and more enjoyable. But don't misunderstand, the best helmet is not necessarily the most expensive helmet. Rather, it's the one that fits comfortably without affecting performance or your ability to ride while maintaining a level of approved safety and protection. For that reason, MotoSport stocks more than 300 dirt bike helmets from nearly 30 manufacturers. MotoSport is the best place to find Motocross helmets and other accessories for your ride. Use the size charts when applicable to take the guess work out of selecting your product. If a helmet doesn't fit, our hassle free return policy means we make it easy for you to get the right one. For additional help call us on our toll free line 866-677-7338 or check out our Dirt Bike Helmet Buying Guide.